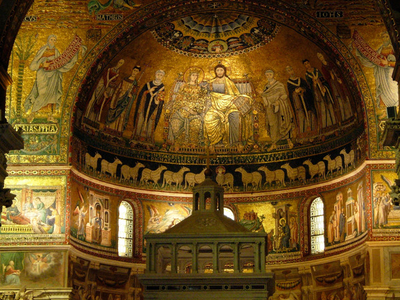 The Basilica of Our Lady in Trastevere (Italian: Basilica di Santa Maria in Trastevere) is a titular minor basilica, one of the oldest churches of Rome, perhaps the first in which Mass was openly celebrated. The basic floor plan and wall structure of the church date back to the 340s. The first sanctuary was built in 221 and 227 by Pope Callixtus I and later completed by Pope Julius I. The present nave preserves its original (pre-12th century) basilica plan and stands on the earlier foundations. The 22 granite columns with Ionic and Corinthian capitals that separate the nave from the aisles came from the ruins of the Baths of Caracalla, as did the lintel of the entrance door. Inside the church are a number of late 13th-century mosaics by Pietro Cavallini on the subject of the Life of the Virgin (1291) centering on a "Corontation of the Virgin" in the apse. Domenichino's octagonal ceiling painting, Assumption of the Virgin (1617) fits in the coffered ceiling setting that he designed. The fifth chapel to the left is the Avila Chapel designed by Antonio Gherardi. This, and his Chapel of S. Cecilia in San Carlo ai Catinari are two of the most architecturally inventive chapels of the late seventeenth century in Rome. The lower order of the chapel is fairly dark and employs Borromini-like forms. In the dome, there is an opening or oculus from which four putti emerge to carry a central tempietto, all of which frames a light-filled chamber above, illuminated by windows not visible from below. 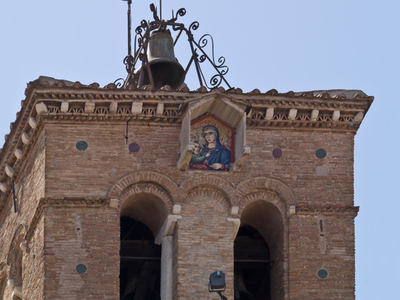 The church keeps a relic of Saint Apollonia, her head, as well as a portion of the Holy Sponge. Among those buried in the church are the relics of Pope Callixtus I, Pope Innocent II, Antipope Anacletus II, Cardinal Philippe of Alençon and Cardinal Lorenzo Campeggio. The Romanesque campanile is from the 12th century. Near the top, a niche protects a mosaic of the Madonna and Child. The mosaics on the facade are believed to be from the 12th century. They depict the Madonna enthroned and suckling the Child, flanked by ten women holding lamps. This image on the facade showing Mary nursing Jesus is an early example of a popular late medieval and renaissance type of image of the Virgin. The motif itself originated much earlier, with significant seventh-century Coptic examples at Wadi Natrun in Egypt. The façade of the church was restored by Carlo Fontana in 1702, who replaced the ancient porch with a sloping tiled roof- seen in Falda's view- with the present classicizing one. The octagonal fountain in the piazza in front of the church (Piazza di Santa Maria in Trastevere), which already appears in a map of 1472, was restored by Carlo Fontana. Here's the our members favorite photos of "Churches in Rome". 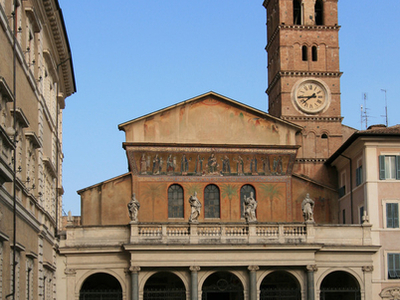 Upload your photo of Santa Maria in Trastevere! Tom Chambers is the only Touristlink member to visit Santa Maria in Trastevere. Have you been here? Click here to save it.